This item (P14652) is not currently available for purchase. Elegant beauty meets rugged durability in this cool white LED commercial light ball that boasts versatility to spare. Adorn it with red ribbon and bows for a standalone Christmas decoration. Use it with other warm white light balls to make a dazzling snowman. Use it with blue, red and green light balls to create a Christmas wonderland. Or fill it with flowers, ribbon or greenery for a colorful decoration any time of year. Sets up in seconds; collapses back for easy storage. 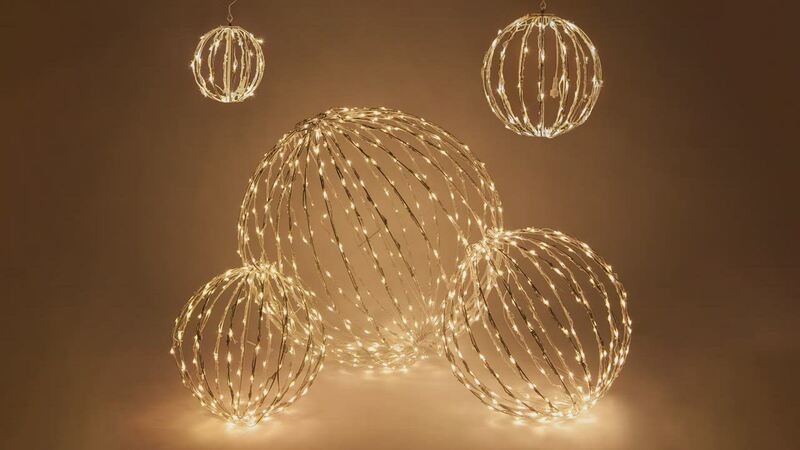 Plus these light balls can be connected end-to-end: up to six together for the 16" size; five for the 20" size and three for the 32". Between its rugged construction and LED lights, you'll be exploring the many uses of this light ball for years. Awesome lights! I add a couple each year. Pretty soon my whole yard will be covered!! !